The Sawtooth Mountains are best known for their dramatic skyline that towers above Stanley, Idaho. The impressive eastern front that stretches from Galena Summit to Copper Mountain disguises a network of additional mountain ridges and river canyons on the western side of the range. Winter snows that accumulate in the Sawtooths supply water to three major river systems. The entire eastern front drains into the mighty Salmon, one of the longest free-flowing river systems in the United States. 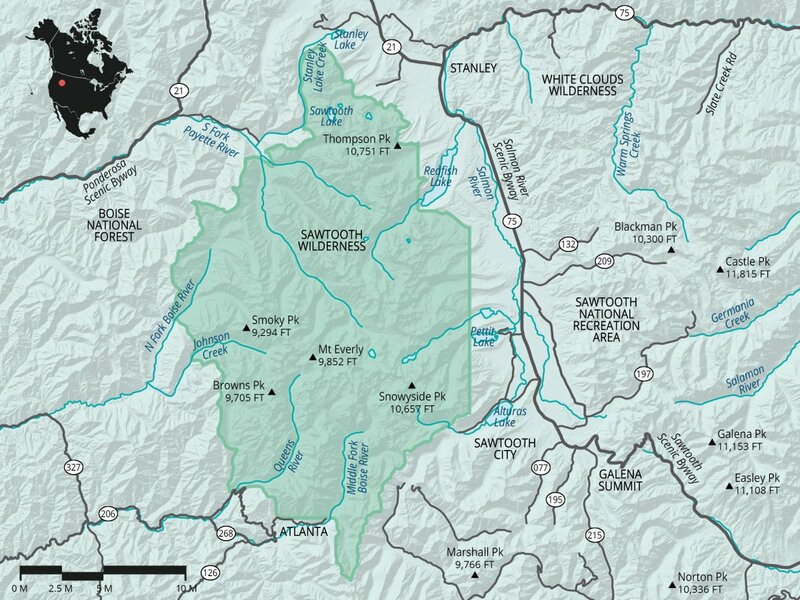 The South Fork of the Payette penetrates deep into the heart of the range, draining most of the western Sawtooths. The southwest flanks of the range feed three major tributaries of the Boise River. From north to south they are the North Fork, Middle Fork, and the South Fork of the Boise River. The eastern front of the Sawtooth Mountains rises abruptly for more than 4,000 feet above the Salmon River. This steep face has been thrust upward along what geologists have long identified (but only recently discovered) as the north-south trending Sawtooth fault. A similar feature called the Montezuma fault parallels the west side of the range. Large-scale, basin, and range faulting pushed the Sawtooth Mountain block skyward and opened the Salmon River valley at its feet. The underlying geology of the Sawtooths is relatively simple. Many millions of years ago, two large bodies of igneous rock cooled beneath central Idaho, forming, at different times, a light white and reddish-orange granite. The latter of the two, called the Sawtooth Batholith, tends to be more resistant to erosion and forms some of the most impressive peaks in the Sawtooths. Both bodies of granite are riddled with joints that trend northeast to southwest. These joints provide avenues for erosion to segment the ridgelines (especially those running perpendicular to the trend of jointing) into the needle-like “sawteeth” found in many parts of the range. The Sawtooths are a heavily-glaciated mountain range. Evidence of glaciers flowing out of the mountains is apparent at every elevation. The peaks, carved into sharp rock horns and connected by long arête ridgelines, tower over numerous lakes in the alpine cirques below. These cirques stand at the head of long, glacially-carved U-shaped drainages. Waterfalls tumble into these drainages from dramatic side canyons left hanging by the retreating ice. On the east side of the Sawtooths the maximum extent of the ice is incredibly well preserved by a series of lateral and terminal moraines. The glaciers deposited these ridges of rock waste alongside and at the snout of the ice flows. When the ice melted, these natural dams impounded large lakes like Stanley, Redfish, Pettit, and Alturas that offer great water-based recreation right at the foot of the Sawtooths. The relatively high elevation of the Stanley Basin (6,300 feet) and upper Sawtooth Valley (7,100 feet) provided a geologic control for how deep and far the glaciers could carve. The result on the eastern front is a series of relatively short canyons between 6 and 10 miles long that spill onto the broad, open valley floor below. On the west side of the range, however, there was not a similar geologic control. The glaciers were able to scour deeper into the landscape, leaving behind a more complex system of canyons and tributaries. Hikers exploring the west side of the range will encounter longer canyons (12 to 20 miles in length) with larger rivers, more difficult crossings, and canyon walls that tower more than 3,000 feet overhead. The Sawtooth Wilderness boundary surrounds the highest elevation terrain in the range. In this alpine “core” nearly 60 peaks rise above the 10,000-foot mark, with Thompson Peak, the highest, topping out at 10,751 feet. Outside the wilderness boundary, the north and south ends of the range slope downward from this alpine core. The terrain to the north of Stanley Lake Creek and south of Alturas Lake Creek, though beautiful in its own right, is more subdued with fewer alpine basins, virtually no lakes, and only a handful of rugged peaks. Most of the Sawtooth Mountains fall under the management directives of the Sawtooth National Recreation Area (SNRA). Carved from the Sawtooth National Forest in 1972, the SNRA was established by Congress, in part, to halt the development of a huge open pit molybdenum mine in the White Cloud Mountains. The SNRA includes the Sawtooth and White Cloud Mountains on both sides of the Sawtooth Valley, and portions of the Smoky and Boulder Mountains to the south. The majority of the rugged peaks and high-mountain lakes that make up the heart of the range are contained in the 217,000-acre Sawtooth Wilderness. Also established in 1972, the wilderness is contained with the larger SNRA. In addition, the Salmon-Challis, Boise, and Sawtooth National Forests manage the northern, western, and southern fringes of the range respectively. Wilderness has been woven throughout the fabric of our heritage. It was not always considered a place of value, as reflected in the writing of an early settler: “Wilderness is a dark and dismal place where all manner of wild beasts dash about uncooked.” In the early 1900s, as the last remnants of our vast landscape were rapidly disappearing, people became aware of the power and importance of preserving these places. By the 1950-60s advocates for the preservation of these beautiful landscapes and intact ecosystems were working with Congress to provide permanent protection for these areas. In 1964 the Wilderness Act was signed into law, the first of its kind in the world. By definition, Wilderness is an area “where the earth and its community of life are untrammeled by man, where man himself is a visitor who does not remain.” Here nature is allowed to function without human influence, the sights and sounds of motorized vehicles and mechanized equipment do not intrude, and visitors can truly get away from the constant hum of a fast-paced world. During your trip you will find that the Sawtooth Wilderness gets into your soul. What you don’t see is as important as what you do see. Climb a peak and you can sense that you are the first. Look up to the sky and see the stars as you’ve never seen them. Know that you’re alive with a dip in one of the hundreds of icy clear lakes. And when you return to everyday life, remember that the Sawtooth Wilderness remains a place where you can find yourself in a way that is not possible anywhere else. I have a responsibility to ensure that the Sawtooth Wilderness lasts forever. This responsibility is not mine alone. With the freedom of wilderness travel also comes responsibility - to care for and to protect the land, the water and the wildlife. As you embark on your visit please take time to think about the fact that the choices you make on your wilderness trip can have far-reaching consequences. With Federal protection, careful management and responsible use, the Sawtooth Wilderness will remain an enduring resource to be enjoyed by all generations. Howard Zahniser, a principal author of the Wilderness Act, laid the foundation for this legacy of protection. As he writes, “To know wilderness is to know a profound humility, to recognize one’s littleness, to sense dependence and interdependence, indebtedness, and responsibility.” You can find out more at www.wilderness.net. The intricate network of Forest Service trails in the Sawtooth Mountains resembles a spider web laid over the landscape. Trails leading up the various canyons usually connect over mountain passes between 8,000 and 9,500 feet into adjacent drainages. This creates many loop and point-to-point routes that are far longer than what can be covered in a single day. Day hiking choices are “limited” to out-and-back hikes up the various canyons. With more than 20 different canyons that drain the eastern front of the Sawtooth Mountains, day hiking options are far more plentiful on the Stanley side of the range. Some of the most popular hikes lead to high mountain lakes (Alice Lake), but scenic canyons (Alpine Creek Canyon), wildflower meadows (Elk Meadow), and secluded waterfalls (Lady Face Falls) are accessible to those not willing to make the longer treks into the high-country. The options are only limited by how far your legs can take you! On the western side of the divide, trailheads out of Grandjean, Atlanta, and Queens River have more limited day hiking options. There are fewer drainages and steeper and longer approaches to the alpine basins (Spangle Lake). While it may be more difficult to reach the alpine terrain in one day from the west side, exploring the lower reaches of these canyons (Middle Fork of the Boise) is certainly worth an afternoon spent walking through the awesome terrain! In general, the Sawtooth Range does not have a plethora of great mountain biking. One of the reasons riding is so limited in the Sawtooths is because the large chunk of federally-designated wilderness prohibits mechanized travel. This restricts mountain biking to the north and south ends of the range, or in the narrow slice of foothills between Highway 75 and the wilderness boundary. Where riding is permitted, many of the trails cross unsorted glacial moraines and are typically quite rocky and technical in nature. The best pure mountain biking objectives are the Elk Mountain Loop and relatively smooth trails of Trap Creek, Bench Creek, and Alturas Lake Creek. The loop around Redfish Lake is quite scenic, though it is also very rocky in places, and the all-day loops south of Alturas Lake (Smiley Creek to Big Smoky and Alturas to Johnson Loop) have some great riding but definitely fall into the “adventure biking” category. The Sawtooths are a backpacking paradise. With multiple access points on both the east and west sides of the range, it is possible to create a wide variety of routes. Almost every drainage in the Sawtooths hides a string of beautiful sapphire lakes ringed by impressive granite walls and jagged spires. Backpackers can limit trips to a single alpine basin or envision a nearly limitless variety of multi-day loops and point-to-point traverses of the entire range. The list below outlines a few of the more logical and popular backpacking routes. • Grandjean Loop #1 - Trail Creek to Sawtooth Lake to North Fork of Baron Creek (19.4 miles/3,943 feet). • Grandjean Loop #2 - South Fork of the Payette to Cramer Lake to Baron Lake and down (41.4 miles/6,764 feet). • Grandjean Loop #3 - Combine #1 & #2 (53.7 miles/10,000 feet). • Stanley Lake Loop - Stanley Lake Creek to McGown Lake to Sawtooth Lake to Alpine Way Trail (19.4 miles/3,714 feet). • Redfish Lake Loop - Alpine Way to Imogene Lake to Cramer Lake and down (32.4 miles/7,054 feet). • Toxaway/Alice Loop - Up Yellow Belly drainage and down Pettit drainage (18 miles/3,169 feet). • Queens River Loop - Queens River to Johnson Creek to Little Queens River (29.8 miles/5,930 feet). • Grandjean to North Fork of the Baron to Sawtooth Lake to Iron Creek (15.2 miles/3,638 feet). • Redfish to Cramer Lake to Hidden Lake to Grandjean (29.7 miles/3,509 feet). • Redfish to Baron Divide to Baron Lakes to Grandjean (18.9 miles/2,923 feet). • Redfish to Cramer to Ardeth to Spangle to Powerplant Campground (33.7 miles/5,243 feet). • Alturas to Mattingly Divide to Powerplant Campground (16.9 miles/1,767 feet). • Atlanta to Ardeth to Cramer to Baron to Sawtooth to McGown to Stanley Lake (68.1 miles/11,818 feet). At first glance, the sharp ridgelines bristling with spires appear to present a formidable challenge to anyone hoping to stand on a Sawtooth summit. By some accounts, there are 147 significant summits and spires in the range. Of that number, an impressive 35% require technical fifth-class climbing to reach the high point. Of the remaining 96 peaks, a full 75% require scrambling and route-finding difficulties in the Class 3 to 4 range. So while there are a handful (23) of summits with easier Class 2 routes, the majority of scrambling in the Sawtooths demands strong nerves and competence in exposed terrain. Climbers visiting the Sawtooths should be familiar with the two major types of granite. In general, most of the technical routes have been developed on the reddish Sawtooth Batholith granite. The lighter grey granite found is part of the older Idaho Batholith and is of a more dubious quality. Shallow, pinched-out cracks and a crumbly ball-bearing-like surface is, unfortunately, typical of formations composed of this granite. The Sawtooths have a long history of technical climbing that is covered in Exploring the Sawtooths – A Comprehensive Guide. It should also be noted that the Sawtooth Wilderness has a “fixed anchor” ban that prohibits bolting on new or existing routes. For a more complete list of the established routes in the Sawtooths, please visit The Elephant’s Perch in Ketchum, Idaho (866.327.3724). They have an “in-house” guidebook that outlines the established climbs with both photos and occasionally route topos. The Elephants Perch above Saddleback Lakes is composed of Sawtooth Batholith granite and has the greatest concentration of multi-pitch routes in the range. Other “hotspots” include the Finger of Fate above Hell Roaring Lake, and the Warbonnet/Baron Spire region at the head of Baron and Goat Creeks. There are hundreds of additional routes and crags throughout the range, but with no published guidebook (Tom Lopez's Idaho - A Climbers Guide covers some routes), climbers who venture beyond the popular walls will have a true wilderness climbing experience. Alpine lakes. Backpacking loops. Technical climbing and mountaineering. Stunning scenery. Sections are remote and hard to reach. Can be crowded (by Idaho standards). Does anyone have an overview of the Stanley Lake Loop as described in the backpacking section (roughly 19 miles). I can't find a description anywhere on this site or the broader internet and I'm looking to go mid-August. Discovered The Sawtooths through a friend in Idaho. One of my favorite spots in the western US. I've done the hike to Hell Roaring lake and up to Finger of Fate lake. Been back a number of times because I absolutely love this place. My only advice if you go in the summer it rains in the afternoon so it's best to get an early start imo. Prepare for a wide range of temps. Always fill out id info at the trail heads just in case. And be sure to visit the cafe/store in Stanley for some great food.